These contemporary takes on the classic margarita, mojito, and cosmopolitan to bring modern mixology to a whole new level. 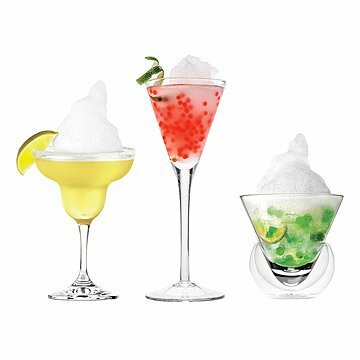 Deconstruct the drink's standard ingredients—such as the mojito's mint leaves, the cosmo's cranberry juice, and the margarita's lime—into buoyant "caviar" bubbles or flavor-filled clouds of foam. It's even possible to encapsulate every ingredient in the drinks into spheres that explodes with flavor, introducing your tastebuds to the very essence of each cocktail. Give guests a taste of the unexpected with these three, easy molecular recipes that bring ths cutting-edge drinks sensation to your home bar. Includes instructional booklet. Materials come from Canada, the USA, Belgium and China. Assembled in Canada. I love this so much! I ordered the Cocktail Trio for myself thinking it would be a fun thing to try with my friends during our girls' nights, but I never thought the kits would be such a hit. The cocktails are surprisingly easy to make, considering this was everyone's first attempt at molecular mixology. The instructions are super clear and the tips and tricks in the included booklet are a life saver. I also like the variety of cocktails (mojito, margarita and cosmo) the trio lets you make. All in all, this is a super fun party item. These contemporary takes on the classic margarita, mojito, and cosmopolitan to bring modern mixology to a whole new level.